The inspection of a private polytechnic carried out by the State Private Educational Institutions Regulatory Commission following complaints of poor performance has revealed glaring shortcomings in infrastructure, faculty and facilities. Accusing the PK Dhumal government of promoting land mafia, the Himachal Swabhiman Party has demanded a White Paper on land deals of the Gopalpur tea estate, Rampur Keonthal and private universities, particularly Arni university. Chief Minister PK Dhumal today said the BJP was committed to the service of the people and the government had ensured progress and development in the state. Chief Minister PK Dhumal yesterday alleged that the UPA government was discriminating against the state as it had reduced the quota of rice, liquefied petroleum gas, sugar and kerosene. Chief Minister PK Dhumal addresses a public meeting at Khundia, near Palampur, on Sunday evening. Deputy Mayor and CPM leader Tikender Panwar today demanded a probe into the postgraduate entrance examination of ayurveda by Himachal Pradesh University (HPU) yesterday. Chief Minister PK Dhumal has said all 40 gram panchayats of the Ghumarwin constituency will soon be provided potable water as Rs 102-crore Kol Dam drinking water supply scheme has been finalised. Inspired by Himachal Administrative Services officer Hirda Ram, who won the last Renuka byelection on the BJP ticket, Kishore Kumar Thakur, a former forest officer, is now staking his claims to contest the Assembly poll from Sarkaghat. At present Sarkaghat is represented by Col Inder Singh of the BJP. The HC has dismissed the anticipatory bail application of Pooja Sharma, allegedly involved in a forgery and cheating case. According to Dr Rajiv Bedi’s complaint, she had posed as an IAS officer. The affairs of the International Roerich Memorial Trust (IRMT) may finally be settled, with the government deciding to formalise the appointment of Russian and Indian curators and approve the inventory prepared by the team from the International Centre for Roerichs (ICR) in Moscow. The HP High Court today issued a notice to the state government and the Vivekananda Medical Research Trust, Palampur, on the issue of alleged illegality committed by the trust for its formation. Residents in the Nalka panchayat, among the most backward in the district, appear to be leading a life of neglect with Doon MLA Vinod Chandel failing to address their problems. 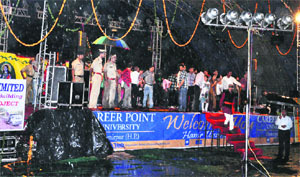 The torrential rain washed out the second cultural evening of Hamir Utsav last night. The Himachali Night, in which folk artistes of the state were scheduled to perform, had to be abandoned due to a downpour. Education Minister ID Dhiman, who was the chief guest on the occasion, delivered his speech after lighting the lamp. The food processing cell set up to implement the centrally-sponsored National Mission on Food Processing (NMFP) project will soon prepare a vision document highlighting the state’s vision for the growth of food-processing industries in the state. Notwithstanding the directions of the state government to clear proposals of new industrial units at the earliest and provide facilities at their doorstep, the inordinate delay in giving letters of approval to investors has defeated the very purpose of granting clearance. Two industrialist brothers from Himachal Pradesh, who were on their way to Shimla from Kala Amb, were killed in a road accident as the car in which they travelling rammed into a Haryana Roadways bus, 7 km from Naraingarh, in wee hours of the morning. This rainy season has brought several hazards and threats to the lives of farmers of the district. After poisonous snakes, prowling leopards and rabid stray dogs, now it is the turn of lowly, meek and otherwise shy mongoose which has caused concern in most parts of Behna Jattan gram panchayat near here across the Gobind Sagar for the past several days. Two girl students of HP Agriculture University, Palampur, and KLDAV College here were crushed to death near Taragarh Palace, 10 km from here, last evening on the Palampur-Mandi national highway when they were hit by a speeding truck. Both were not wearing helmets. The police has recovered the body of a young married woman from the riverbed of the Ravi near Dharwala alongside the Chamba-Bharmour highway on Saturday last. This was revealed by Kulbhushan Verma, Deputy Superintendent of the Police (DSP), Chamba police headquarters, here today. The police here has arrested driver Ram Kumar of truck (HP-24C-2595) and Gopal, vice-president of Kuddi gram panchayat, near here, under charges of beating and killing of Mukesh Kumar, driver of tipper (HP 96A-1563), on the Ghaghas-Brahm Pukhar road last night. Ram Singh of Surhan, Baggi, Katola, has lodged a complaint with the police that some of his relatives conspiring with others had grabbed his land and killed his son Hem Raj (21). As per the inspection report of the commission, Gauri Shankar Memorial Polytechnic at Arki was not only woefully short of infrastructure, but was also consistently showing zero per cent result. Of the 215 students who appeared in five diploma engineering stream examinations in the first semester from July to November 2011, only three passed. One student each passed in electrical, mechanical and civil engineering and none in automobile and electronics and communication engineering. In the third semester examination, only seven of the 242 students passed, all studying civil engineering. The results of the other five streams was zero per cent. The results of the fifth semester were better, with 30 of the 242 students clearing the examination. In all, the pass percentage was zero in eight and less than 7 per cent in five of the 16 semester examinations. The pass percentage was more than 15 per cent in only in two examinations, the highest being 24 per cent for the fifth semester of electronics and communication engineering. The inspection was carried out after the commission found the reply of the institution authorities to the notice issued on the basis of a complaint not to be satisfactory. The institution was short of faculty. It was revealed that there were only 28 faculty members though a strength of 50 was required as per norms of the All-India Council for Technical Education (AICTE). The authorities at the institution had reported 49 teachers to the AICTE. The post of principal was vacant. Tuition fee was to be charged in two equal instalments. The authorities had collected the fees for the second semester, from January to May, in November, before the declaration of results of the previous semester. It included amalgamated fund and development fund, but separate accounts were not maintained. The commission served a notice on the institution authorities to comply with regulatory norms within a month or face action. Interacting with mediapersons here today, party president Subhash Sharma said the government was facilitating real-estate business in the garb of private universities. The fact that Gopal Kanda had acquired Arni university came to light only after he was arrested in connection with the Geetika Sharma suicide case, he said. The truth behind questionable deals involving the Gopalpur tea estate and the huge chunk of land at Rampur Keonthal could brought out only by bringing out a White Paper, he added. Huge chunks of land were allotted to the Himachal Pradesh Cricket Association, headed by Dhumal’s son Anurag Thakur, he said. No action was taken on the excavation to set up a cricket academy in Shimla and the damage to the the Education Directorate building. He demanded an FIR against the association. He added that the land mafia was eyeing the Annandale ground. He claimed that the Dhumal family was running the government and as a result, the structure of governance had collapsed. He demanded that the Chief Minister and his Cabinet colleagues declare assets before elections. He said over 1 lakh posts were vacant and the youth were being denied jobs. Instead of making regular appointments, the government was recruiting staff on contract, he said. He demanded that the period of contract be limited to a year, after which service should be regularised. He was addressing a public meeting after laying a number of foundation stones and inaugurating projects and schemes worth Rs 29 crore in the Naina Devi constituency. He inaugurated the Rs 5.88 crore drinking water augmentation scheme at the main market chowk in Bilaspur. He later laid foundation stones of water harvesting tanks from the Gambhrolla Khud at Noa, Parohi and Khui worth Rs 3.5 crore. The Chief Minister also laid foundation stones of the Rs 50 lakh Tourist Wayside Amenities Centre of the Tourism Department and the Jagatkhana Tanbol lift irrigation scheme worth Rs 11.24 crore. He laid the foundation stone of the Rs 80 lakh Trauma Centre at Suharghat and inaugurated the Block Development Office covering 24 panchayats and the Rs 1.39 crore tehsil office. The Chief Minister said the state government had won 70 national awards in various fields during this tenure. He said the government was the first to introduce between 80 and 90 per cent subsidy for setting up polyhouses for farmers. He said the state was the first to have a dispensary of the Animal Husbandry Department in areas under every panchayat, to double daily wage from Rs 75 to Rs 150 and to give benefits worth Rs 7,500 crore to employees. The Chief Minister assured local MLA Randhir Sharma that the state government would order the Public Works Department to carry out repairs of National Highway 21. Dhumal announced that the high school at Suharghat and six middle schools of the area would be upgraded and a pedestrian path would be laid at Suharghat. Addressing a public meeting at Khundia, 30 kilometres from here, last evening, he said the Centre had also not released funds for the maintenance of six national highways in the last two years. He said the UPA was yet to sanction Rs 4,000 crore as arrears for the BBMB hydroelectricity project. Despite a Supreme Court order, the Centre had delayed the matter for political considerations, he added. He said the Centre had also rejected the proposal to shift the Dogra Regiment from Faizabad to Himachal Pradesh though the state government had assured free land for the purpose. Dhumal said most schemes implemented by the state government were popular even in other states. He said the Atal Swasthya Sewa provided timely treatment to patients at their houses. He said the Chief Minister Vidyarthi Swasthya Programme had been implemented and its second phase, which included dental check-up and deworming tablets, was in progress. He said the state was the first to introduce the Muskaan Yojna on free denture facility for senior citizens from below poverty line families and had extended assistance to 5,600 persons. He said the state had pioneered the Atal School Uniform Yojna by spending Rs 64 crore on providing two sets of uniform per academic session with stitching charges of only Rs 100 to bring about uniformity in educational institutions. 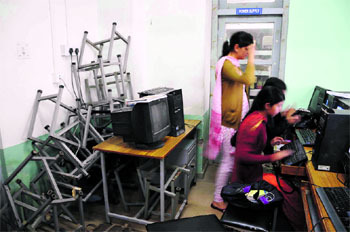 In a letter to Vice-Chancellor ADN Bajpai, Panwar said there was doubt that the paper had been leaked. “The question paper was not sealed and was being carried open by examiners, giving reason for doubt,” he said. Panwar said in another deviation, the question paper in three series were the same, though in the past there had been different serial numbers for different questions. “I urge you to have a thorough probe and the results should be withheld for the time being,” he added. This will also benefit five gram panchayats of Bilaspur sadar and 13 of the Jhandutta constituency. The Chief Minister was addressing a gathering at Galahi village in Hatwaad area, 65 km from here. Dhumal said the government had taken a policy decision to supply better variety of grain and fodder seeds at 50 per cent subsidy. He declared a grant of Rs 8.62 lakh for Government Senior Secondary School, Marhana, and said this area would get a primary health centre from next year. foundation stone of Rs 23.28-crore Seer Khud channelisation scheme. The Chief Minister announced that Government Polytechnic College had been inaugurated at Kalol in the Jhandutta constituency in this district, while another landmark in the history of Bilaspur, the first hydro-engineering college of country at Bandla hill near the town, was being obstructed by Congress leader Virbhadra Singh. Also present on the occasion were IPH Minister Ravinder Singh Ravi and MLA, Mandi, Gopalpur and Col Inder Singh (retd). Presenting his credentials as a social worker at a press conference here today, Kishore claimed that he took voluntary retirement just to serve people of Sarkaghat. “My family is devoted to social service. My father served in the Army and my grandfather was a sarpanch. Our family is devoted to the BJP,” he said. Even if denied the ticket, he would consult his supporters before making up his mind, he said. “In 2007 also I had applied for the ticket, but this time I am a serious contender,” he added. He had alleged that he paid money to her and her accomplices on her assurances of facilitating the grant of permission for the purchase of land and the setting up of a nursing institute. The meeting of the executive of the IRMT will be held on September 17. All pending issues will be settled. The ICR, in a communication to the state government, has suggested the name of L Surgina as curator from the Russian side. She is currently at Naggar, heading the team from Moscow which is undertaking the task of preparing the inventory of paintings and other precious artifacts which are a part of the Roerich heritage at Naggar in Kullu. The state government has decided to appoint two curators, an Indian and a Russian, for proper preservation of the rare collections at Naggar. “The appointment of OC Handa as Indian curator and L Surgina as the Russian one will be formalised at the meeting of the executive so that its affairs can be run smoothly,” confirmed a senior official. The inventory prepared by the ICR team would be examined and approved. In his letter, LV Shaposhnokova, vice-president of the ICR, said the earlier proposal to appoint M Chiratve the Russian curator was dropped as he was not an expert in museum work. He would return to Russia with the ICR team, he added. “Surgina is not only an experienced manager and a specialist in the field of museum work, but is acquainted with the Roerich’s work,” he wrote. The ICR pointed out that a team of three experts would be sent to Naggar with an interpreter to help Surgina complete her task. The ICR was keen on art and memorial collections, archives and other structures and new expositions in the Roerich House and the Urusvati Institute. The vice-president of the ICR expressed concern over the continuation of control of the premises with Elina Adamkova, the previous curator. “She is no longer an IRMT employee, but still controls the premises keys, which is not in line with the common practice of property transfer and puts in jeopardy the result of our experts’ work,” he observed. The ICR was keen to sign a detailed protocol of cooperation between the IRMT and the ICR for the creation of a world-class museum and scientific complex. The court passed this order on a petition filed by Bhuvnesh Chand Sood of Palampur alleging that residents of the Palampur area have been shown a dream of having a hospital like the PGI, Chandigarh, and such an announcement regarding the same was first made by former Chief Minister Shanta Kumar in 1990 and he also announced the formation of this Trust with an understanding that it would be controlled by the state government. Later, residents of the area started making donations for the hospital. It alleged that a fraud had been committed on people as instead of a charitable hospital, which was the dream of residents, a commercial establishment has been established, which is in violation of the provisions of the Trust Act. It further alleged that instead of establishing a hospital first, an institution was established in the name of “Kayakalap” comprising over 60 rooms on 90 kanals. There are over 60 rooms in the Kayakalap centre, which was given on rent on a daily basis on high rates. It was further alleged that Shanta, the founder trustee of this Trust, and others are enjoying the benefits in the name of Trust. 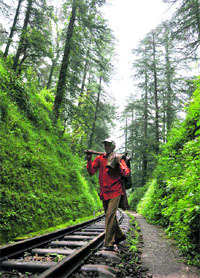 In 2001, 99 hectares was given to the Trust for 99 years’ lease at Rs 1 as its annual lease money. But the same land was in the name of the National Biological Research Institute and as per the revenue records, the nature of land was shown as a tea garden. It alleged that then how could the land again returned to the state and not even this the nature of the land was also got changed to “Banzar Kadim”, which was a tea garden earlier. All such things have been done without adopting a proper procedure and a detailed inquiry is required in the matter. The petitioner urged the court to give direction to the state to take over the entire property of the Trust and run the same itself for the purpose for which it was formed. He further urged the court that an independent probe be conducted in the matter. While issuing a notice, a Division Bench comprising Chief Justice Kurian Joseph and Justice Dharam Chand Chaudhary directed the respondents to file their reply within six weeks. Link roads have not been maintained and bus service to the area is irregular. The panchayat has a population of at least 2,000 and most are Scheduled Castes. In the latest incident, the Baddi-bound HRTC bus did not turn up, posing problems for schoolchildren and people working at industries in Baddi. State Congress general secretary Ramkumar Chowdhary spoke to the HRTC Regional Manager and helped restore the bus service to the area. Residents rued that the Doon MLA did not address the problem. Chowdhary said about 20 link roads were laid in 2006-2007, but were not maintained and had to be closed. He added that the government had failed to construct a 1-km road to connect the Bhud-Bhatoli Kalan-Patta road to Ghrer village. Addressing residents during a panchayat as part of his public campaign for Rajiv Gandhi Panchayati Raj Programme today, Chowdhary said the indifferent attitude of the MLA had exposed the ruling party’s anti-people policies. The torrential rain washed out the second cultural evening of Hamir Utsav last night. The Himachali Night, in which folk artistes of the state were scheduled to perform, had to be abandoned due to a downpour. Education Minister ID Dhiman, who was the chief guest on the occasion, delivered his speech after lighting the lamp. Folk singer Sharda Sharma sang two songs. Soon, sharp showers turned into a downpour and people started running for cover as water started entering tents. The audience was quite disappointed as rain spoiled the cultural evening in which top folk artistes of the state were scheduled to perform. The minister and other dignitaries had to leave the place in a hurry. The rain also damaged some music instruments. A state-level committee has already been constituted to oversee the working of the cell and the process to appoint a consultant is at an advanced stage. Tenders for the same were invited on August 10 and after the evaluation of bids, the process of appointing the consultant was being finalised now, said Dr Rajinder Chauhan, Adviser, Industries. He added that an amount of Rs 2.69 crore had been received from the Centre as part of their share of 75 per cent, while the remaining 25 per cent would be contributed by the state. Apart from the vision document, operational guidelines covering various criteria for carrying out earmarked activities under the project would also be chalked out by the consultant. Various activities, including technology upgrade, setting up of new units, modernisation and expansion of food processing industries, would be covered under the scheme. The public would be educated about its usefulness through conducting promotional activities. Efforts to introduce a course on food processing in universities are also being mooted. Aimed at enhancing the level of processing of perishable foods from 6 per cent to 20 per cent and value addition from 20 per cent to 35 per cent nationally, the project will help enhance the country’s share in global food trade from 1.6 per cent to 3 per cent, while the level of processing for fruits and vegetables is envisaged to increase from the present 2.2 per cent to 10 per cent and 15 per cent in 2010 and 2015, respectively. The scheme has also lit a ray of hope for the agrarian community in the state. The state government had convened the last meeting of the state-level Single Window Clearance and Monitoring Authority on August 18 and granted approval to three proposals for additional industrial investment and expansion of four existing units involving an investment of Rs 325 crore. These ventures will provide employment to 578 persons. Though officials profess the need to follow a facilitative regime to promote the industry, its actions appear to be delaying investment and even after a lapse of over two weeks, investors are awaiting letters of approval. With the Assembly poll slated to take place by the year end, investors are fearful that the model code of conduct will be imposed soon and it will put their projects in a limbo. Since every new project has to seek permission from several departments, including HP State Electricity Board Limited, State Pollution Control Board, IPH and Revenue, a sizeable time has to be invested in seeking these approvals that will begin once they receive the letters of approval from the Directorate of Industries. Sources in the directorate said the minutes of the meeting were yet to be approved from the Industries Minister after which these would be sent to the Chief Minister’s Office for approval and finally back to the Directorate of Industries. The directorate would then issue letters to individual industries. Officials of the Industries Department had failed to get the approval when the Chief Minister and the Industries Minister were available in Shimla last week for the Assembly session and they would now have to wait for them in Shimla. The Director, Industries, was not available for comments, while other officials were hesitant to comment on the issue. Brothers Ashok Verma (44) and Pradeep Verma (41), who were residents of Nahan, had their individual factories at Kala Amb from they had to pick up some documents as they had to appear before a court in Shimla today. As they reached near Naraingarh in a self-driven car, a Haryana Roadways bus of Yamunanagar depot which was coming from the opposite direction, rammed into their car. The two died on the spot. As the matter was reported to the police, a team of officials reached the spot to take stock of the situation. Later, the police registered a case against the driver of the bus, while the bodies of the two victims were shifted to the Civil Hospital for postmortem examination. Reports said a mongoose had bitten Class IX student Neha, daughter of Surender Kumar in Ladheda village. She had to be rushed to the Regional Hospital here for treatment. Led by panchayat president Raj Kumar, vice-president Jaswant Singh and panchayat members Maya Devi, Bahadur Singh, Suneeta Devi and Shankari Devi, a large number of villagers, including Dev Raj, Dila Ram, Ch Runka Ram, Manoj Kumar and Nand Lal, said these mongooses had caused panic in these villages. Women were now fearing to go to the fields for work for fear of these attacks, they added. Actually mongooses are known to help farmers by destroying poisonous snakes in earlier days of their birth. A single female snake lays some 70 to 80 eggs at a time. The newborn snakes immediately start out to feed themselves. Most of these, however, become victims of animals like mongooses, cats, birds etc. Another villager Jagdish Chandel of Behna Jattan is getting treatment at Ghumarwin hospital for a mongoose bite that he received some days ago. Ramesh Chandel of Sanehad village and cattle of a woman of Sarayen village were also victims of mongoose bite. The police said Anchal (19) and Kushum (18) were on their way to Paprola on their two-wheeler when the accident took place. Anchal died on the spot, while Kushum, who had received head injuries, was referred to the Medical College at Tanda. Later, Kushum also died in the hospital. The police said the accident occurred when the girls tried to overtake a private bus, but were hit by a speeding truck coming from the opposite direction. Both the girls were residents of Banuri village of this subdivision. They belonged to middle-class families. Soon after the accident, local residents and students of HPAU assembled a the local Civil Hospital, and lodged a protest over the poor medical facilities. The residents criticised the hospital authorities for referring Kushum to Tanda instead of providing her immediate medical aid here. In another accident, Rashil Singh of Mahjerna village was killed when a motor cycle hit him on the National Hospital outside a automobile showroom here yesterday. Rashil had come to the showroom along with his daughter for the servicing of her bike. The police has registered a case against bike owner Vikrant Sood of Chauntra in Mandi district. Vikrant also had received injuries and was admitted to the Medical College, Tanda. The DSP divulged that the woman, identified as Kanto Devi (22), had been missing from her Lohadka village in the district since August 18. Her parents had got an FIR lodged with the Bharmour police station against her in-laws the same day, he added. Superintendent of Police Santosh Patial said here today that at Sandoli the two vehicles had a minor accident and both the drivers had an exchange of hot words. But later, Ram Kumar and Gopal mercilessly beat up tipper driver Mukesh Kumar, causing him serious injuries. They later admitted him first to Markandeya Community Health Centre and then brought him to the Regional Hospital at Bilaspur town where Mukesh died. The two had earlier fled from the hospital. They later abducted his wife Kali Devi and also killed her in the recent past, he alleged. But the police claimed that “his son died due to an accident fall, while his wife was still alive as she had got married to someone else”. On the direction of Judicial Magistrate (First Class), Mandi, Court No. 2, Rajesh Chauhan, the police has lodged an FIR against 22 persons named in the case by petitioner Ram Singh. Ram in his complaint alleged that some of his relatives in connivance with others had hatched a conspiracy and grabbed his land at Surhan village in Baggi. They allegedly had killed his son last year near Pandoh, from where his body was found later. The accused had also abducted his wife and later killed her, the complainant said. The police has registered a case of murder of his son and wife under various sections of the IPC. ASP, Mandi, Ravinder Singh Jamval said the police had interrogated all the accused in the case in connection with the alleged murder of his son, but no involvement was found. Ram’s son had died after he had slipped and fallen into a nullah near Saat Meel, near Pandoh, last year. The police had recorded the statements of eyewitnesses in the case at the time of the incident, he said. Hem Raj was coming from Katola to Pandoh that day and was not murdered. The interrogation of the accused revealed that Ram’s wife was alive. She had deserted him and got married to someone in Kullu. “We are trying to locate her whereabouts,” Jamval said. He added that the police was also investigating the charges of land grabbing as alleged by the petitioner and would submit the challan to the court in the case.